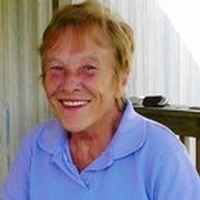 Sallie Hunt Armistead, 81, a native of Poquoson and resident of Williamsburg for 40 years, passed away unexpectedly Wednesday, April 14, 2010, at Sentara Norfolk General Heart Hospital. She was a member of Tabernacle United Methodist Church as a young girl and later in life was baptized in the Baptist faith. Sallie loved the simple things of life, puzzles, crosswords, watching hummingbirds, and her companion dog, "Cuddles". Sallie was preceded in death by her husband, Robert Armistead; parents, Robert E. & Elizabeth M. Hunt; and a sister, Ruth Shutt. She is survived by a son, Bubba Carmony and wife, Melinda; three daughters, Betsy Page and husband, Vernon, Belinda Rowe and husband, Willie, and Sheila Hairr and husband, Greg; eleven grandchildren, Brian Page, Robbie Page, Paul Page and wife, Desiree, Cliff Rowe and wife, Julie, Tammy Rowe, Jeff Rowe, Michael Rowe, Amanda Carmony, Tabitha Montgomery and husband, Ryan, Chris Hairr, and Tim Hairr; great-grandchildren, Ashli, Hunter, Annmarie, Georgianna, Austin, Logan, Braylon, and Trenton. The family will receive friends Saturday, 12:30-2:00 PM, at Claytor Rollins Funeral Home, Poquoson, immediately followed by a funeral service at 2:00 PM in the funeral home chapel by Rev. Pete Hurst. Burial will follow at Peninsula Memorial Park, Newport News. Online condolences to www.claytorrollins.com.